Here at Tile Town, we cater to all your flooring needs. This means that as well as flooring itself, wealso supply all the necessary accessories and technical elements. To be able to enjoy your underfloor heating to the full, you need to be able to accurately control the temperature and the times that the heating comes on and switches off. 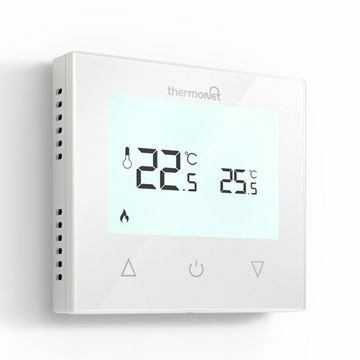 We supply premium thermostats from the manufacturer Thermotouch to guarantee you an uncomplicated, efficient experience when using your underfloor heating. 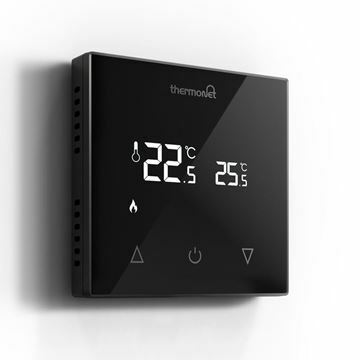 As well as being outstanding in terms of technical spec, the thermonet thermostats that we offer are also high-end when it comes to aesthetics. You don’t need to worry about a boxy, cheap-looking control system cluttering up your wall: these thermostats come in a beautiful, chic glass design to fit the most stylish of spaces. Choose from Piano Black or Ice White to compliment your flooring and the rest of your interiors. We offer two types of thermostat: manual and WiFi. Both offer impressive functionality and allow you to precisely control your heating for optimum usage. Both come with a 3 year warranty, so if anything goes wrong (which it shouldn’t! ), then you’re covered. Here is a little more information on the two options. The 5215 or 5216 high-performance manual glass thermostat is the ideal choice for straightforward yet reliable control of your underfloor heating. It is simple to operate with its clear on/off control and uncomplicated manual temperature adjustment. The thermostat is operated by touch-screen and the sleek, clear backlit LED display has adjustable the brightness. To ensure that your settings can’t be tampered with, there is also the option to lock the screen by holding the up and down arrows for 5 seconds. But never fear – the ease of use of the 5215 and 5216 thermostats by no means compromises their fantastic functionality. Settings are fully adjustable, with temperature limits and calibration to maximise efficiency. There is also a built in ambient temperature sensor and external floor sensor for precise management of temperature. The 5220W or 5226W WiFi thermostat can be controlled remotely from your mobile or device. This option is perfect if you are always on the go and would need to be able to control things remotely. Or if you just like the thought of switching the underfloor heating on whilst travelling home on a cold day so it’s nice and toasty for when you arrive! This thermostat allows you to fully program your underfloor heating schedule and control everything through your Apple or Android device. You can program 6 heating events (3 on and 3 off) for each day of the week. This means that everything is automated and once it is set up, you don’t need to think about it anymore. If it’s particularly chilly and you want a bit of extra warmth, all of the manual functions are still available, so you can give it an extra boost while waiting for scheduled heating to come on again. Explore our thermostats and find out more detailed information below.